In a consumer-driven marketplace, as users make split-second decisions across connected devices, an error message or broken experience can cost valuable conversions. Users interact with advertisements in a wide range of contexts and on a multitude of devices and operating systems. Whether it is a banner advertisement on a news website, an interstitial video ad in a video game, or a link in a social feed from a paid influencer, the user needs to end up at the correct destination. To complicate this, various technologies and techniques exist for deep linking users to the correct content, dealing with users on a desktop rather than a mobile device, and accounting for user fall-off between impression and click. This, coupled with the need for dynamic redirection and content serving, makes it difficult for marketers to measure performance and optimize the user experience. With SmartLinks, marketers can ensure a friction-free user flow by combining deep linking technologies with branded landing pages and dynamic routing by platform. App store URLs, deep links, Universal Links, and App Links are created and managed all in one convenient location with Destinations. Marketers can then apply these destinations to trackers, landing pages & more. iOS’ Universal Links and Android’s App Links are enhanced linking experiences that deliver users directly into a marketer’s app or an equivalent web experience in the absence of the app on the user’s device. A marketer running a campaign to drive sales from new users may not want to force a user to download and install the app to complete a purchase. Universal Links remove the conversion obstacle, allowing the user to complete the purchase through the normal website. Meanwhile, a “Get the App” button on the website banner would still allow them to download and install the app. Use Case: A clothing retailer is running a campaign. Instead of the ad click taking users without the app to the app store, a Universal Link or App Link can send them to a web domain that mirrors the in-app purchase experience. Similarly, the brand can include these links in a user acquisition campaign targeting specific users. Instead of automatically sending these new users to the app store, they can get the conversion sooner by allowing them to complete the purchase before asking them to install the app. Use as an option to continue creating deep links. 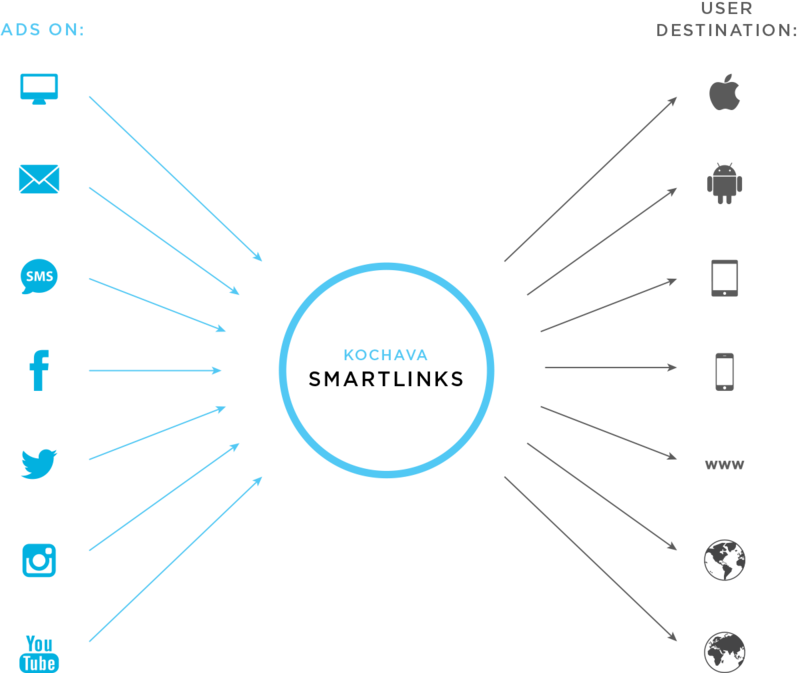 Deep links were the first way to reroute users to different locations and is supported by Kochava. 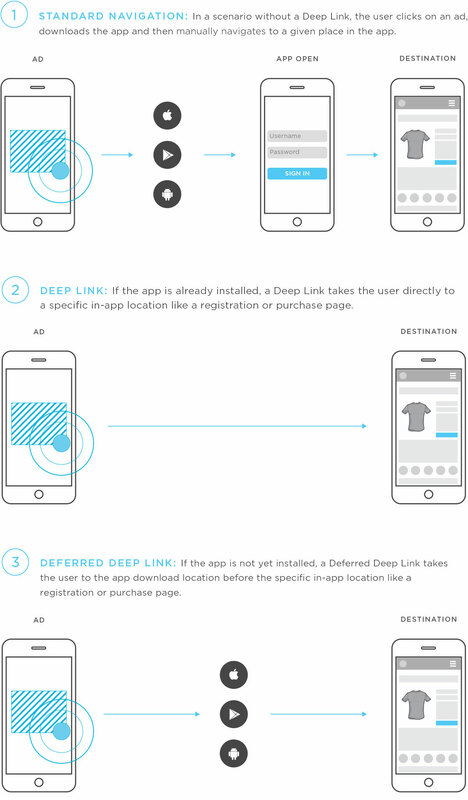 Use Case: When a marketer has not instrumented support for App Links or Universal Links within their app, traditional deep links can deliver a user to a specific in app location with tailored content. For instance, if a marketer runs a retargeting campaign seeking to drive existing app users to purchase a specific running shoe, a deep link can be added to a Kochava tracker that would land the user at checkout with the specific shoe already in their cart. Landing pages are another option for creating a frictionless user experience and allow marketers to control the message users see before they install the app. Marketers can also add a “text me the app” button to give users another option for installing the app. Marketers can select a landing page template to edit with custom, app-specific messaging and branding which is hosted by Kochava. These pages can serve as a destination both for Universal Links and App Links or as a custom landing page for users on desktops who click on a link intended for a mobile device. Use case: A marketer is working with paid influencers to drive installs of their gaming app. The influencer can’t link directly to an app store from their social post, so the marketer creates a landing page through Kochava. The landing page can be branded by the marketer with custom text content for each influencer. A “Get the App” button allows users to jump to the app store. In addition, the marketer can include text-the-app functionality, allowing users to enter a phone number and receive a trackable download link by text message. Dynamic Routing links are intended for owned media (email or text campaigns, web banners, social posts). Marketers can improve the user experience by redirecting them to specific locations and measuring them as they cross over from owned media channels to the app based on the specific location and device model that the user has. Use case: A gaming app’s marketing strategy focuses on social media influencers. They give their influencers Dynamic Routing links to post on their personal accounts, redirecting their followers to the app store or other destination. Define rules that run in the background when a user clicks on an ad. These can include device operating system version conditions, redirecting users to geo-specific app stores, or creating a single link for off-network marketing. For example, if a marketer has an iOS app that will not run on pre-iPhone 5 devices, they can create a mobile web destination for devices matching that description. This way, they can message users that need to update their device to use the app. For more information, visit our support documentation on Universal Links and App Links or instructions for creating deep links.